Here's one. Maybe it'll be fun. Just because. This is knot coming from nowhere. Thank you, TSN. I've gained so much about something so mundane as shaving for goodness' sake, from the knowledge and experience from the seasoned wet shaving members. Besides family, work and guitar the Shave Nook has been a significant slice of life since becoming a member. It's an entertaining way of spending some time. Perhaps in some cases, myself included, too much time. Still, I enjoy checking in multiple times a day, and have gotten to know strangers from all walks of life from around the world. Most of us seem like people who could engage in friendly conversation even in the extra-interwebs world. I say that knot with/out tongue in cheek. Members freely participate in any or perhaps all of its various "chat rooms." I like to believe that on some unquantifiable level, members develop bonds (over shaving, of all things!) that make this a friendly and pleasant community. Phil and the Moderation Team do a helluva job maintaining this great oasis on the internet. It's the only such forum in which I have any interest in participating. TSN is a way of temporarily tuning out the real world environment in which we exist in real time. TSN is where members engage in considerate conversation that you could let the whole family read, although truthfully I think they'd be bored silly by most of it. Thanks, TSN, for all that. 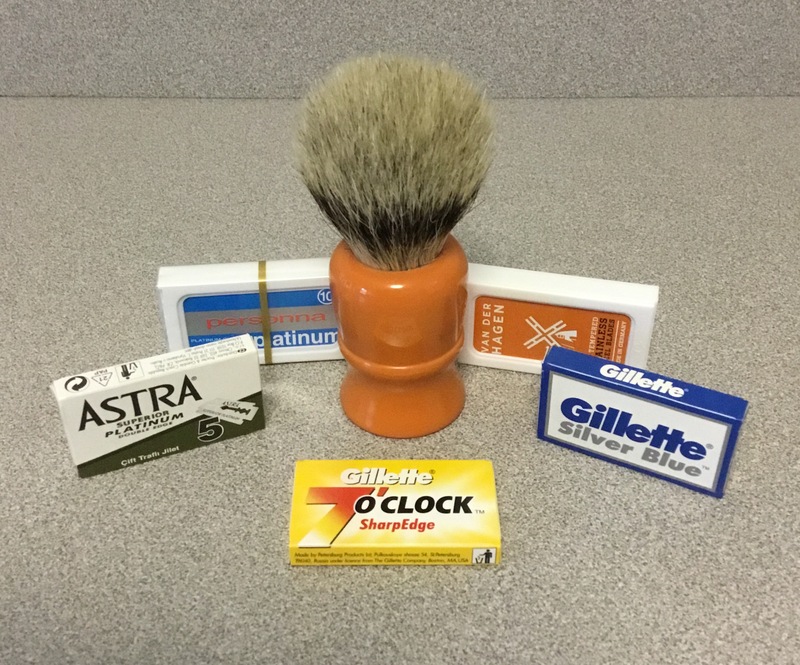 In the spirit of giving back to the community, I'd like to pay it forward to a newer member perhaps just starting out on his wet shaving experience, with this groovy little butterscotch beauty and a little selection of blades (that may yet grow) to try out, just because. Here's the point of the PIF. If you're like me, you started out with generally inexpensive (and perhaps in some cases, poor quality) brushes. Easily, my first dozen brushes were such. They were decent for sure, most cost less than $40. My feeling at the time was pretty much, "I don't need a silvertip badger brush to make lather; this (fill in the blank) brush will get the job done just fine!" And it did. They all did. Mostly. They were a variety of boar, pure badger and horse. Most were very good to excellent quality. Some were just, meh. Yet, after a while I decided I didn't like scritch, or the feeling of boar bristles in general, on my face. No offense intended, just my opinion (and anyway, we all know what they say about opinions). I was ready for something completely different. Once I learned that better quality badger hair made shaving even more enjoyable for me, there was no turning back. Silvertip, baby. That's all I wanted. This WD is three years old, in lightly used condition. It was my first "custom-made" brush. It's small, but feels good on the face. iirc the knot is set to 20/45. The handle originally held a pure badger knot that was a shedder. Later, Larry graciously agreed to replace that knot with this silvertip knot. I don't use it anymore only because I like the way bigger brushes feel. Someone else should use it. It's a shame to see it sitting around unused. That's it. It's knot much. But it's butterscotch. Hold on to your scuttle, 'cause here's where it gets really interesting. Senior members in good standing can participate, too. Make a good faith pledge to PIF a shave related item to another new member. Such a pledge should obviously include postage for said PIF. For every (please, only one) item pledged by a senior member, another active member will be eligible to receive said PIF. In the interest of transparency and to keep it fair to all who choose to participate, it doesn't matter what type of item except that it's intrinsic value not exceed $50. All it takes is one other senior member PIFer to say, "I'm in." At some point early on, in an as yet unidentified, post # should be used to track and maintain Potential Pairs of PIFer and PIFee will somehow connect for said exchange of said PIF. Second person who pledges starts the PPPP post. EDIT: See post 5 for the list. The arbitrarily chosen membership date of March 1, 2017 shall be the defining characteristic of "new member." Open period will be from whenever I click "post" until 11:00 PM, Sat., Sept. 16, 2017 at which but at yet unspecified time shortly thereafter, the PIFee(s) will be selected by an online randomizer. To be eligible you must be an Active/Senior Member in good standing. Otherwise, like love, "I'm in," is all you need. Creative PIF Charlie. As I understand it, the PIF could grow as members add items to it. At the end, will everything go to one winner, or will there be a separate random winner for each item? One winner for each pledged PIF. I will start the list with my next post. Each respondent can post independently in his own post indicating if he's in as PIFer or PIFee. I will update the list periodically until the close of the PIFing period. Charlie, will you be doing the random drawing for each item? Here you go. I figured it out. At close of open period, the listed PIFees will be randomly reordered and paired with a listed PIFer in numeric order. By entering, each chronologicaly chosen PIFee agrees that he's paired with the next to reply PIFer, regardless of PIFer or PIF. If PIFers exceed PIFees all PIFees will get one item and the remaining items will languish with their present (and generous) owners. If PIFees exceed PIFers, they will again be randomly reordered as above, except not everyone will receive a PIF. Now this appears to be easily manageable and doable. Thank you all for your patience while my feeble brain worked out the protocol. Special thanks to Ricardo for making me think with more clarity about how to make it work. He truly is "The Legal Razor." 1. chazt. Brush and blades. "Charlie, will you be doing the random drawing for each item?" If people want to do their own drawings individually that could probably happen with a concerted effort to do the right thing. EDIT: Yes, Ricardo. As now detailed in post 5, the assignation of PIFee to PIFer seems easily manageable and should address any selection concerns. Therefore, there should be no need for individual PIFers to select their own PIFee. As OP I will address the issue of making PIF pairs. I understand and appreciate the mods' questions. If you feel the scope is too far, please by all means, let me know and I'll redo to just a one-off PIF. It could be fun and interesting Charlie. I'm just trying to understand how this will work. I'm not clear if each eligible new member is entering for a shot at a particular item, or entering for a shot at anything. +1 to everything you said in the first post. Cool idea Charlie. That is a pretty awesome brush, not in though. 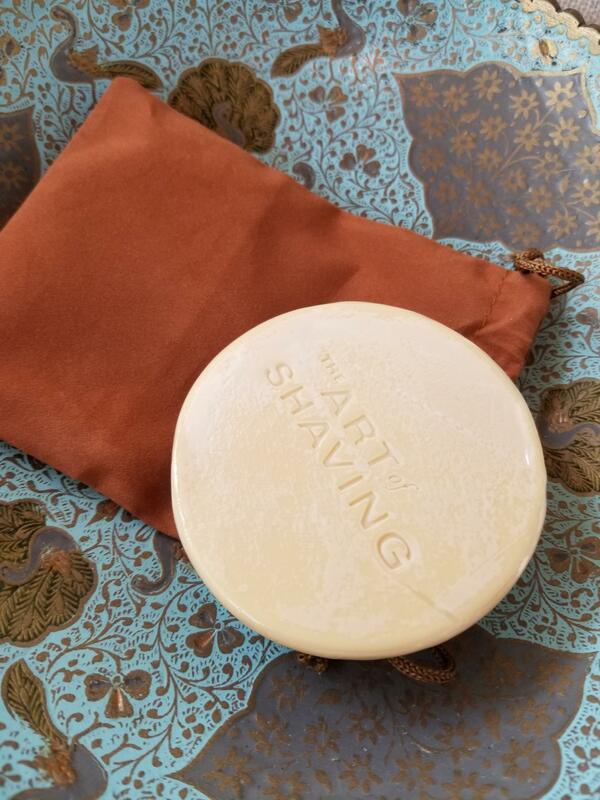 But I pledge to PIF a puck of NOS Tallow Art of Shaving Sandalwood. Wow, that's a fine offering Tom! "It could be fun and interesting Charlie. I'm just trying to understand how this will work. I'm not clear if each eligible new member is entering for a shot at a particular item, or entering for a shot at anything." Good point. By entering, each chronologicaly chosen PIFee would have to agree that he's paired with the next to reply PIFer, regardless of PIFer or PIF. (08-31-2017, 07:45 PM)wreck | fish Wrote: +1 to everything you said in the first post. Cool idea Charlie. That is a pretty awesome brush, not in though. But I pledge to PIF a puck of NOS Tallow Art of Shaving Sandalwood. Thanks, Tom. I've added your name to the list. Ricardo, thanks for humoring me while I figured out the fine points. I think I've worked out the details and have addressed your concerns and questions. Your input helped me to focus and clarify. Okeydoke then. PIF would seem to have run its course with no further interest. Thanks, Tom. You're a stand up guy. You too Charlie. A nice idea.